This level have normal difficulty and just need few steps that will help to reach requirement easily within few moves. 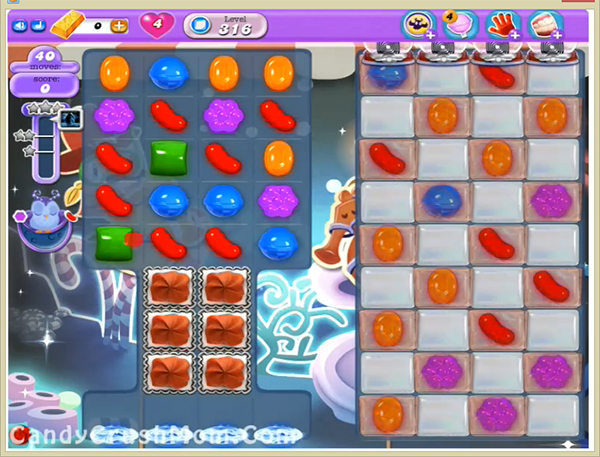 For this level first try to play from bottom on left part of the board so candies could appear to right part of the board. Then try to use striped candy or striped candy with wrapped candy combo to break all jellies. Wait till 20 moves then you will have moon struck after use special combos with colorbomb to reach requirement within less moves. We completed this level with 266740 score using same technique that we share above and got three star score plus reach requirement before 10 moves.